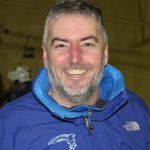 SSE Level 3 Development and Moguls Coach, BASI 2. First started skiing age 13 on a school ski trip and was then lucky that my older brother got a job in Switzerland for 5 years so spent the winter holidays in the Swiss alps. I first got involved with Sharks about 13 years ago when my eldest daughter Tori, wanted to carry on skiing after coming back from a family ski trip. We started skiing on a Saturday morning at Sheffield Ski Village and after drinking coffee and reading the paper for a few months I made the mistake of asking Norman if I could help in any way. A Level 1 instructor course followed and my career in instructing began by helping Maddie Holding, then the Club captain, with Whales and Tigers. I like to mix up my skiing and love a hooligan razz down the piste with my fellow blue jackets, blowing away the cobwebs at the end of the ski day but I can also often be seen peering over the edge to see what the off piste has to offer. As a family of 5 skiers our garage has more than a passing resemblance to Ellis Brighams with a wide variety of skis to choose from. My current main pair are Salomon Q98’s, I got them to replace a pair of Scott Missions that I loved but sadly trashed at New Year. The jury is out on the Q98’s at the moment they do a lot of things well but are a bit soft when pushing on. There may be a pair of Head Magnums on the shopping list for an end of season bargain hunt! As for a favourite ski run and resort, it would take a lot to beat dropping down the black from the top of Grand Montets in Chamonix and finishing off the day with a great live band and a load of beers in Chambre Neuf. One last run before you die….I’ve been lucky enough to have done a couple of Heli Skiing trips and getting dropped off on the top of the Candian Rockies for a blue sky powder day does take some beating. Skiing heroes – Ingmar Stenmark – so good they had to change the rules to stop him winning! Roberto “La Bomba” Tomba – living proof that red wine and pasta make an awesome skier! Katie and Molly Summerhayes – fantastic skiers, great kids and I get the claim to fame that I’ve coached Olympic and World Champions. Doesn’t get better than that.